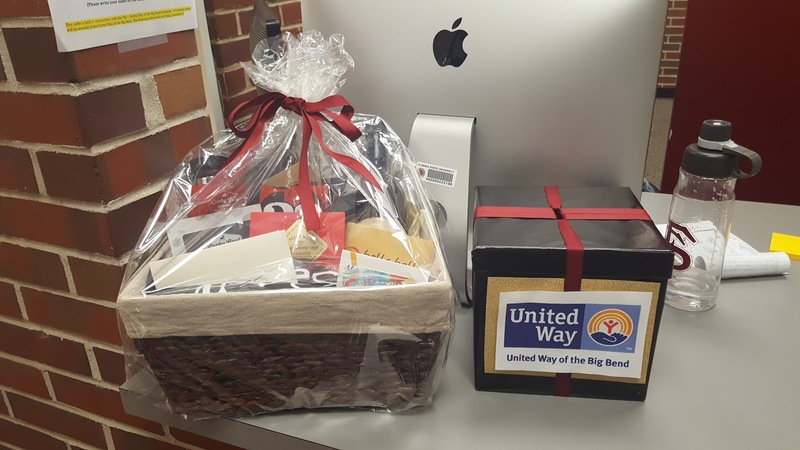 Don’t miss your chance to win The College of Fine Arts “Taste of Tallahassee” raffle benefiting the FSU-United Way Campaign! The drawing will be held Friday, December 2, 2016. *Tickets are $1 and can be purchased in the Dean’s Office. The basket was entirely underwritten so 100% of your dollars will go to the United Way! *CFA Faculty and Staff who have or plan to turn in FSU-United Way Campaign pledge forms by December 2 will automatically be entered into the drawing with 1 ticket per each dollar pledged. The United Way Big Bend‘s (UWBB) mission is to unite the support of citizens to make a stronger, safer, and healthier community. UWBB leads collective action to create a community of healthy babies, successful students, responsible adults, and active seniors. They are dedicated to supporting the greatest variety of human service agencies in the local area, helping people from all walks of life and income groups, and creating collaborative strategies that result in long-lasting, positive change.